FeedBack is a reflections blog authored by the AFI-FFT Grad Cohort on their experiences in the program. After getting the news that my Food from Thought Research Assistantship (FfT RA) application was accepted, I was excited but also a little nervous. During our first group meeting, it was apparent that the fifteen other students in this year’s FfT RA cohort felt the same way. Dr. Evan Fraser, along with last year’s cohort, reassured us and helped guide us through our first group discussion. Each student was asked to introduce themselves, and to my surprise, there were a wide variety of disciplines from across the university represented in our cohort. It was clear that this would be an excellent opportunity to connect with students we wouldn’t have interacted with otherwise. We were given five research topics, each paired with an industry partner, and all relating to the Arrell Food Institute’s vision. Of the various topics, I immediately gravitated towards the food loss and waste project, as I have an interest in improving best management practices through innovative technology and automation. 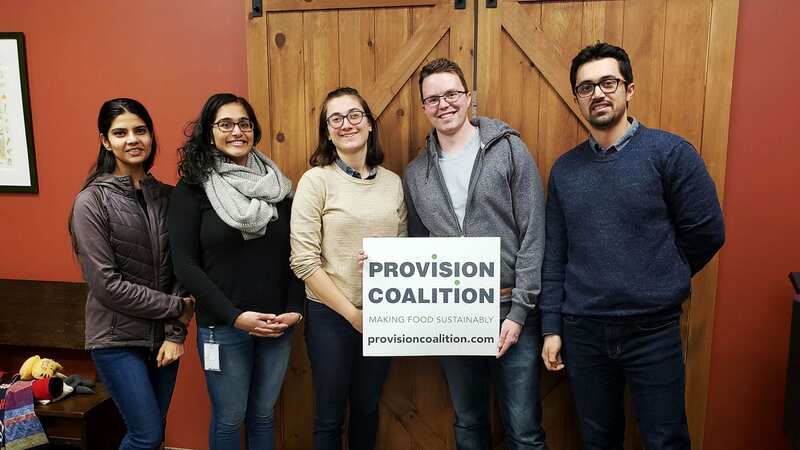 Our group formed shortly after with Praveena Thirunathan from the School of Engineering, Sugandha Raj from the Department of Pathobiology, Seyed Ahmadi from Family Relations and Applied Nutrition, and myself (Jared Stoochnoff) from Environmental Sciences. After much deliberation, we decided to create a social marketing campaign to raise awareness about the true cost of food waste in the food and beverage manufacturing industry. As a group we researched social marketing campaigns and pitched our ideas to PC. Instead of presenting our campaign to a small audience at a few trade conferences we decided that the most efficient way to spread our message was using LinkedIn’s campaign marketing tools. It’s been pretty fun to think of graphic visuals that would catch someone’s attention, and then working with a graphic designer to turn our ideas into full-fledged images. I believe that over the past few months we have grown as a group and learned our individual strengths and weaknesses. We found that constant communication between each other was the key to a successful team, and that laid the foundation for us to achieve our project goal. Overall, we have all really enjoyed the cohort program and believe that the connections we have made may turn into career prospects someday.